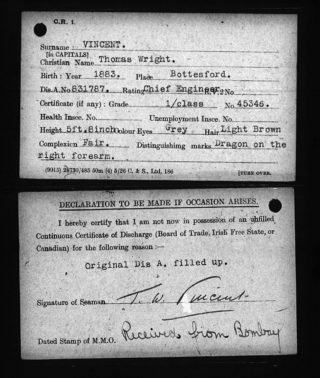 Thomas Wright Vincent identity card, 1918. 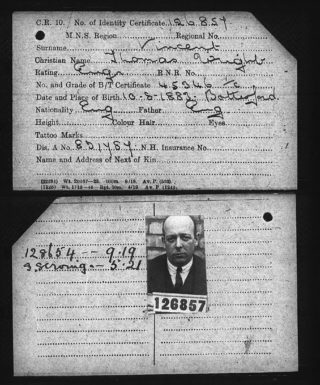 Thomas Wright Vincent identity card, 1921. Thomas Wright Vincent identity card, stamped Tilbury 1939. Thomas Wright Vincent was a merchant seaman who as a boy had lived in Bottesford. He first went to sea in 1904 and was probably still in the merchant navy as late as 1939. However, he may have served with the Royal Marines during WW1 from December 1915. His story came to our attention through by chance coming upon a newspaper article in the Grantham Journal of January 1915 about his ill-luck in being shipwrecked at Kobe, Japan. Otherwise, there is no mention of him in any of the lists of Bottesford servicemen. Thomas Wright Vincent was born on the 10th August, 1883, at Bottesford. His parents were Robert Vincent, born in 1853 at Harlaxton, and Emily Vincent, born in 1859 at Bottesford. In 1891, he was oldest son of Robert and Emily Vincent who lived on Bottesford High Street. Robert, a corn merchant, was born in 1854 in Harlaxton, and Emily was born in 1859 at Bottesford. In 1891 they had six children, Florence M. (10), Emsie/Emily (9), Thomas W. (7), Eric N. (4), Marjorie Lois (2) and baby Katherine, and there were also two living-in servants. By 1901 they had moved to 6 Green Hill, Little Gonerby. Robert Vincent had become the Registrar of Births and Deaths for Grantham. Florence had left, but there were two new children, Frank W (8) and Margaret Vera (6). 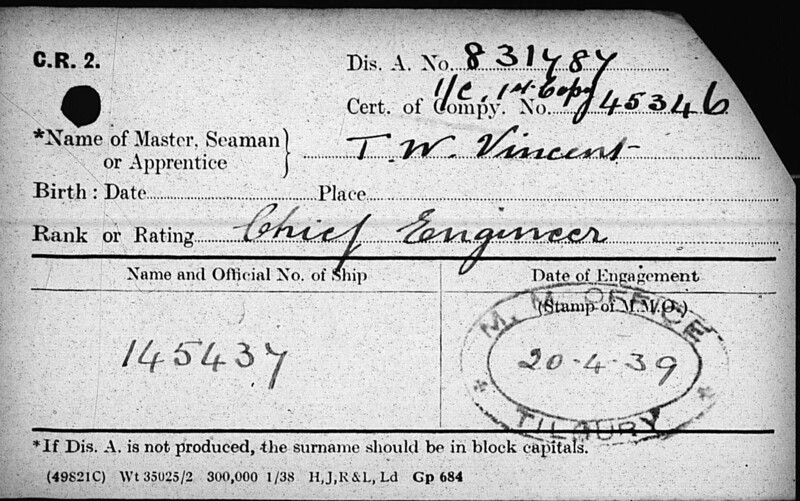 Thomas Wright Vincent joined the merchant navy in 1904, and no record has been found in the 1911 census. He married Margaret H. Castle in the Grantham district in 1913. She was probably Margaret Helen Castle, baptised on the 8th June, 1885, at St Wulfram’s, Grantham. On the 23rd January 1915, the Grantham Journal reported that Thomas Vincent had been shipwrecked on the 11th January when aboard the S.S. “Nile”, which struck rocks in dense fog while entering the harbour at Kobe, Japan. All passengers and crew were rescued but the ship sank. The article adds that he had been shipwrecked before, while on his maiden voyage aboard the S.S. “Australia”, which struck rocks while entering Sydney harbour on the 18th June, 1904. He may well have remained with the merchant fleet throughout WW1, and it is not certain that he enlisted with the forces. Merchant seamen were vital to Britain’s survival, so there is no reason to assume that he would have been under any pressure to enlist. They took enormous risks, and many lost their lives. There is a record of a Thomas Vincent who enlisted on the 11th December, 1915, with the Royal Marines Light Infantry at Plymouth, but this may well have been a different man. Thomas Wright Vincent was awarded campaign medals (National Archive records BT 351/1/144548), but these may not have been military service medals. There is an identification record card from 1918, indicating that he returned to the merchant navy, ID number 126857 and a Dis.A.No.831787. These also indicate that he was a ship’s engineer, becoming a Chief Engineer 1st Class by 1921 when he was in Bombay. Another record card was stamped M.M. Office, Tilbury, 20th April, 1939, indicating that he was still on merchant ships at this late date, 35 years since he first went to sea. It seems that he did not die in the Grantham area. A man named Thomas W Vincent died in 1946 in Mid-Eastern Surrey, and Margaret H Vincent died in Surrey in 1952. He would have been 63 when he died, she would have been 67.